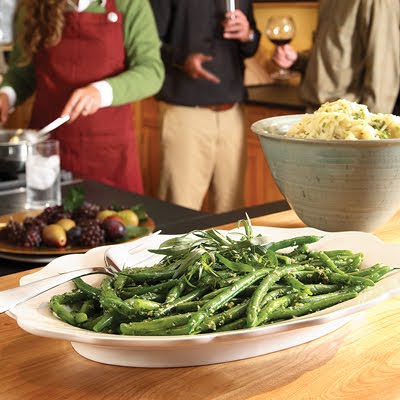 String beans are one of my favorite vegetables, and a fun way to jazz them up is with garlic! I found the following recipe on Delish & it serves 8 people. 1. Bring a large pot of water to a boil. Place a large bowl of ice water next to the stove. 2. Add half the green beans to the boiling water and cook until tender-crisp, about 4 minutes. Transfer the beans with a slotted spoon to the ice water to cool. Repeat with the remaining beans. Place a kitchen towel on a baking sheet and use a slotted spoon to transfer the beans from the ice water; blot dry with another towel. 3. Just before serving, heat oil in a large Dutch oven or large skillet over medium heat. Add garlic and cook, stirring constantly, until fragrant, about 30 seconds. Add the green beans and stir. Add parsley, tarragon, salt and pepper and cook, stirring, until heated through, 1 to 3 minutes. Beans are my favorite, i think i'm gonna like this! Mmmmm. This looks so good!!! Oh yum! Talk about a great way to dress veggies! Yum, I love green beans so I would totally try this. It looks really delicious. Thanks for sharing! And why didn't I think of this? lol I love green beans and I will try this! I always like new ways to spice up veggies! that recipe seems great! i looove beans! most Brazilians do! I like green beans too, thanks for sharing this simple and healthy recipe, looks so delicious. Thanks for dropping by my blog, have a hapoy 2012! YUM! I am posting another green bean recipe too this friday! They are the best! They look delicious. Definitely trying them out. These look delicious! I basically love anything with garlic on it but never thought of adding it to green beans before. I am definitely going to make this! How delicious is this? I love garlicky green beans. The question should be who doesn't love garlicky green beans? I like adding some slivered almonds to the top for some extra ooopmh. Ooh I love anything garlicky! These sound delish! Yum, sounds amazing and so perfect for the holidays! I love home-cooked goodness like this, and I love love garlic! Sounds to good! I could put garlic on anything! i'm not really a green beans fan. but i'm sure this will taste great with asparagus. i'd love to try that! ahh they sound amazing! love green beans. these sound so great! There is a restaurant near my hometown in Canada that serves a similar dish so I'll have to try this! YUM. The seasoning on these sounds amazing! Love green beans and these look like a delicious way to spice them up a little!! This looks so fresh and delicious. Garlic makes everything taste better! Yum, this looks so delicious! Must save this recipe for summer! i love beans! great pictures !! Am definitely going to try this! Looks so yum and will work well as a side dish. delicious!!! wishing you an amazing 2012!!! I'm not a huge fan of green beans, but these are so different that I might have to give them a try. Yum! This looks delicious! Hope you had a wonderful Christmas and wishing you all things bright and happy in 2012! Yumbum! One of my fave side dishes! Omg, I love garlic, this is perfect! Thanks for sharing!! Happy new year! My mom used to always try clever ways like this to get me and my brother to eat veggies. 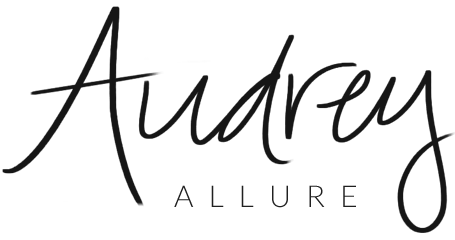 Looks wonderful Audrey. I need to eat more vegetables, and I'm always looking for yummy ways to jazz them up. I'll have to try this recipe! Oooh, this looks absolutely scrumptious!! That looks delicious--and like I'm something I could actually do--lol.